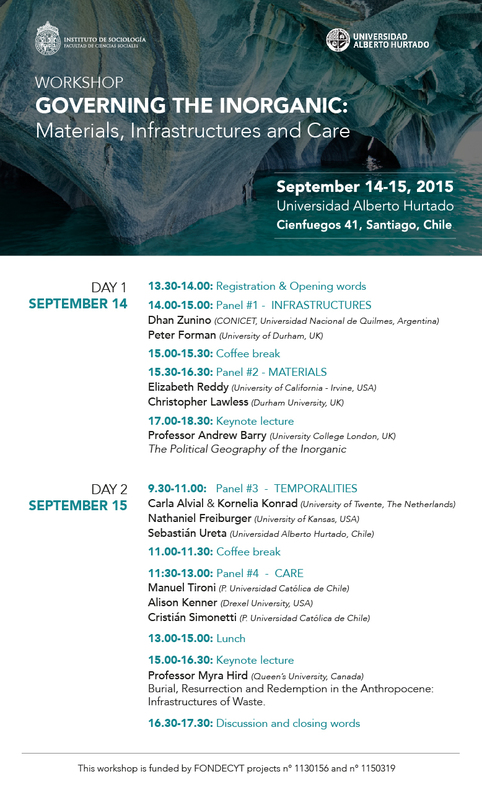 El 14 y 15 de septiembre organizaremos junto a Sebastián Ureta de la UAH el workshop internacional “Governing the Inorganic: Materials, Infrastructure and Care”. Tendremos de invitados Andrew Barry y Myra Hird. Mi presentación Sensing chemicals: sentinel plants and interspecies cordiality in the Anthropocene está basada en nuestras experiencias con plantas en Puchuncaví. Abajo dejo el programa completo, y las inscripciones se hacen a governingtheinorganic@gmail.com. – Dhan Zunino (PhD, CONICET research assistant at the Centro de Historia Intelectual, Universidad Nacional de Quilmes, Argentina): The life of things. Exploring Buenos Aires’ underground as a political arena through frictions between water and mobility infrastructure. – Peter Forman (PhD candidate, Department of Geography, University of Durham, UK): Securing Flows of Natural Gas: The Governance of Inorganic Materials in Transit. – Elizabeth Reddy (PhD Candidate, Department of Anthropology at the University of California-Irvine, USA): The Magnitude of Mexico: Seismic Scientists and Engineers Encounter Earth Motion. Professor Andrew Barry (Chair of Human Geography, University College London, United Kingdom): The Political Geography of the Inorganic. – Carla Alvial & Kornelia Konrad (PhD student, Science, Technology and Policy Studies, University of Twente, The Netherlands): Governing the techno-scientific futures of graphene. – Nathaniel Freiburger (Assistant professor, Sociology Department, University of Kansas, USA): Natural Resource Modes: Lithium and the Topology of Projectness. – Sebastián Ureta (Associate professor, Sociology Department, Universidad Alberto Hurtado, Chile): Give me a background and I will rise a (toxic) world. – Manuel Tironi (Assistant professor, Sociology Department, Universidad Católica de Chile): Sensing chemicals: sentinel plants and interspecies cordiality in the Anthropocene. – Alison Kenner (Assistant professor, Center for Science, Technology, and Society, Drexel University, USA): Exposure Science, Atmospheric Matter, and the Politics of Emplaced Care. – Cristián Simonetti (Research Fellow, the Department of Anthropology, University of Aberdeen and lecturer, Instituto de Sociología, Pontificia Universidad Católica de Chile): Ice and concrete. Two fluid solids of environmental change. Professor Myra Hird (School of Environmental Studies, Queen’s University, Canada): Burial, Resurrection and Redemption in the Anthropocene: Infrastructures of Waste. 16.30-17.30: Discussion and closing words.